The third and final OVA series concluding the story of Tales of Symphonia: The Animation. With the first part being less than great and the second being a fair bit better, the third and final part to the Tales of Symphonia story, and thankfully it makes for a nice conclusion. (+)A satisfying end to the series. The Characters (8/10): With the entire cast already having plenty of previous screen time, each of them individually feel like proper characters (In my review for part one I said, "None of these characters can hold the show by themselves." I take that back for this part.) As for what comes with the conclusion of any given anime, revelations between characters are made, every secret is revealed, and the villains motives are brought to light, which in the case of this anime are actually rather grounded compared to other extreme examples (I'd compare the final goal to Lelouch's from Code Geass). The villain himself though believes in 'the ends justify the means' approach to things. The Art and Sound (8/10 & 7/10): The art just keeps getting better as this series wears on, it is much more standard for ufotable if still a bit downgraded, but it is an improvement from the previous entry. (I'm pretty sure this is because the upped their game with their lighting and shadows). The sound is also an improvement from the last entry, the OP has again to the level of part ones but it's more akin to modern day OP's with the momentary rapid score then slowly down to a more steady pace before picking back up as the episode name pops up, the ED is still on the same level as the previous two though, just with up-tempo vocals this time. Everything else when it comes to sound is good enough to be considered standard but nothing really jumped out at me and made me say, "That one part was great." What do I think of this anime? This was a fitting ending to the series, it's just a shame that you have to go through two lackluster entries to get here. I can not suggest buying this series, it would be preferable to stream the entire show. Would I recommend this anime? Yes, without a doubt. I still highly recommend that you go back to the start and work your way back up to this point, but yes. Please watch this show. Just remember, since this is a threequel, you'll have to watch the first two parts of it in order to get here, and they're not really the best material to watch. Goodbye my brethren, see you in the next one. Also: I'll be posting the same review for all three seasons, since I made a general review for the series, not the seasons in separate. Ok, so if you guys don't know, Tales of Symphonia is one of my FAVORITE animes, along with the rest of the Tales of Series. After i finished ToS, me and a friend had found other animes in the series as well, which we both love to death. So my friend said she found an old Gamecube game that her father owned called "Tales of Symphonia." It was an anime RPG about a girl, Colette, was chosen to be an angel, and the Chosen to regenerate the world. A few days later, I saw she was an anime on YouTube, and it was a good thing a stopped her there, because that was when things got really sad and intense, and she probably wouldn't have looked that happy in first period that day. But anyways, we started watching the series from episode 1, and we finished the series in a few weeks time. For a short anime, Tales of Symphonia is a very good anime, that is really worth watching and re-watching over and over again. I've only watched the series 3 or 4 times, but my friend said she's seen it around 30, maybe 40 times. Anyways, let's get started on the review! Hope you all like it! WARNING! THIS REVIEW MAY CONTAIN SPOILERS! Ok, so I'm sorry if I'm taking this not hard enough, but like I said before, I LOVED this series. It's one of those short stories where you rewatch them over and over again. And only for 11 episodes, it surely brings out its potential. Tales of Symphonia takes place in the kingdoms of Sylvarant and Tethe'alla. where three races of people lived; humans, elves, and half-elves. The half-elves believed that their race was treated unfairly, and formed a pact, called the Desians. The Desians were defeated long ago by the hero, Mithos, and the goddess Martel, but, over time, their power had weakened, and the Desians has risen once more. Meanwhile, Colette Brunel, a 16-year old high-school girl, has been chosen to become the Chosen Angel of Regeneration. Her friends, Lloyd Irving, Genis and Raine Sage, accompany on her journey of regeneration, only to find that out that her journey was more like a sacrifice, if you know what I mean. Now, the gang must try to get her back, while saving the world from hatred. Recruiting a new team of allys, Lloyd and his friends set off to save Colette. and the rest of the world. Like I said before, this is a beautiful story. I'm not going to go much into detail, due to some really big and sad spoilers, but it's a really good story to the anime, and I definitley give it a 10/10. Again, I really feel like I'm being to easy on this anime, it's just I love this anime a LOT. The art style is beautiful in this anime. The special effects, the battle scenes, the designs, EVERYTHING. And I gave it a 10 for art, because everything was beautiful. I'm sorry I'm giving everything on this a ten, I just really fell in love with this series as a whole, art, characters, everything. Another thing I really like about the art is the character designs. My favorites are paticualry Sheena's, Colette's, and Presea's. They're very unique, compared to your typical combat skirt, or suit of armor. Like I said, maybe I'm being to easy on this anime, maybe I'm not. But anyways, another 10/10 for the art. Ok, I really love the soundtrack to Tales of Symphonia. I have all three theme songs on my iPod and I listen to them ALL the time. It's just you don't want to listen to some of them too much, especially right after you finished the series. It kinda stirs up some of the sad scenes from the series (*cough cough* DEATHS *cough cough*) My friend says she hardly ever cries, but this was the first anime that was really hard to watch in public. Even so, there are some themes in the ToS soundtrack that make me smile, while others get me teary-eyed. Whether you see that as a good thing or not, I really enjoyed the soundtrack, even though it gets you in tears at times. So basically, I'm giving it a 9/10, not another 10 suprisingly. Okay, so like I said before, I LOVED everything about this anime. The cast is AMAZING. Like, theyre the kind of cast that you grow attached to, no matter what kind of character they are. And by that, I mean your characters can range from the pervy and outgoing Zelos, to the quiet and strong Presea. And I'm going to admit, I love each and every one of them. It's just one of those animes where I can't choose just ONE favorite character. Like, this is one of those animes where you love ALL of the characters. So yeah, basically another 10 for Symphonia. Tales of Symphonia is my favorite Tales game( My first) i have ever played. Thanks to Tales of Symphonia i have gotten into the Tales series and have played most of all the Tales games out there--even the Japanese versions. 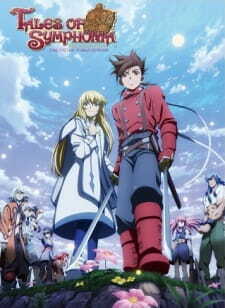 : ) Tales of Symphonia: Sekai Tougou Hen or Tales of Symphonia World's United is the third and final OVA of the Tales of Symphoia The Animation. This takes place after the Tethe'alla arc.As you may know Lloyd and the others are now trying to unite both Sylverant and Tethe'alla as one to prevent the Mana of both worlds from being depleted, As seen in the opening song( which is the most beautiful song ever) we get to see Kratso, Yuan, Martel, and Mithos and the whole Derrs Kharlan war incident that happened with them. Opening song "Honto Uso (ホ・ン・ト・ウ・ソ)" by Me. OMG i cried watching this opening T__T Most beautiful opening I have ever seen. I haven't seen the ending theme yet as i haven't finished watching the first eps. I shall reedit this part out. Tales Fan can really enjoy this series. New fans of Tales can too also. I love the entire Tales series.